A real world language playground - Where spaces come to life and talk! Our custom designed Talkiplay readers are built for small hands, enabling children to explore the world with ease. 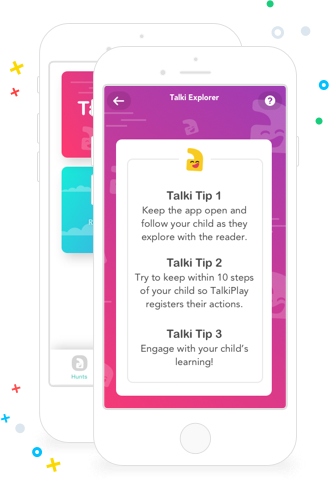 Talkiplay's mobile app uses cutting edge technology to track the child's adventure and sends them on a language learning journey like none other. Embark on an exciting quest, or choose to simply explore - TalkiPlay has games for children of all levels and interests. Explore through active learning and engagement with the physical world, not just through a phone screen. Turn your home into a language learning playground - join the waitlist! Turn your home into a language learning play-ground. Close the language gap, encourage practice between therapy sessions and help children generalise language across multiple environments. Use TalkiPlay technology to transform your space into an interactive learning playground.